Book your door repair service online and describe your problem in detail. The handyman will arrive at your property to carefully evaluate the damages. 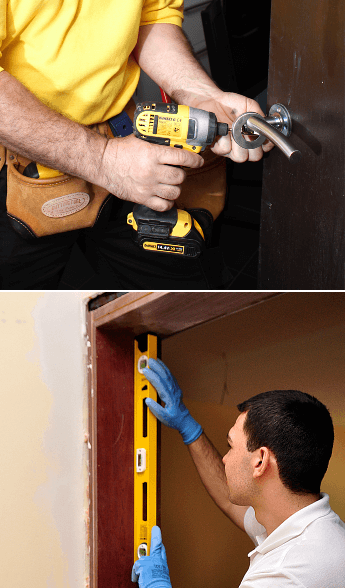 The skilled door repairman will use suitable tools to make repairs to your door. If the door has been damaged by burglars, the expert can install a suitable replacement. We charge per 30 min past the 1st hour. This will ensure that your bill is based on the exact time the pros spend on site. Minimum time per appointment is 1 hour (£31+£24=£55). After the first hour, we will charge on a half-hour basis. Prices are inclusive of all taxes. The handyman repairmen are fully equipped and can even supply you with additional parts and door components such as knobs, hinges, hangers. However, keep in mind that costs for additional parts, if additionally supplied are also included in the final door repairs bill. Even if burglars completely busted your door, the skilled handymen might be able to help you out with a few repairs here and there. And of course, they can completely replace it if there's no hope. They've got all the skills and experience for a quick service with minimum disturbance. You can get this service with up to 20% OFF by joining the Fantastic Club. Become a member today and take advantage of the many perks for only £59 a year. You also get priority for the most convenient booking slots of the week as well as flat percentage discounts for our entire range of services. If you are a landlord or if you simply have more than one household, then you can make considerable savings in a year. No need to wait until you have a free day. Just pick up the phone as Fantastic Handyman can help you any day of the week. 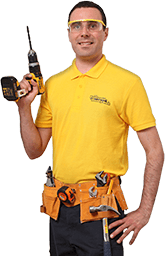 The Fantastic handyman services are available for properties in greater London, within the M25 motorway.